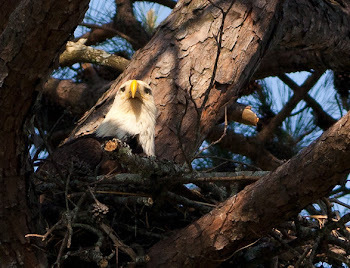 Now that we have successfully launched our Harrison Bay Eagle Cam Project we have turned our attention to yet another environmental conservation project. Several weeks ago Bill Greene and Mitch Sivley approached me with the idea of building and installing nesting tubes for mallard ducks. Mallard ducks tend to nest on the ground or in small patches of grass above the water level but this nesting habitat leaves them vulnerable to predators. Bill and Mitch have been instrumental in our environmental stewardship program for many years so I was very happy to see them taking the lead on improving our environmental stewardship program. I told them to put together some ideas and pricing and we would go from there. 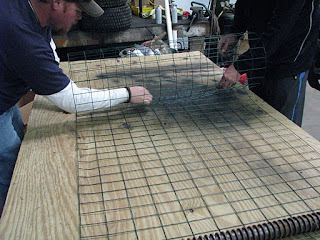 Bill researched different nesting designs and found one at http://www.deltawaterfowl.org/henhouses/build.php that was inexpensive and looked like it would work well. After some discussion, we made some slight modifications to the design that we thought would work better and allow the nesting tubes to last longer and be easier to maintain. One of the main changes that we made to the project was using PVC pipe for our support for the nesting tube. The PVC was a more readily available material around the maintenance building and would cost less to use. 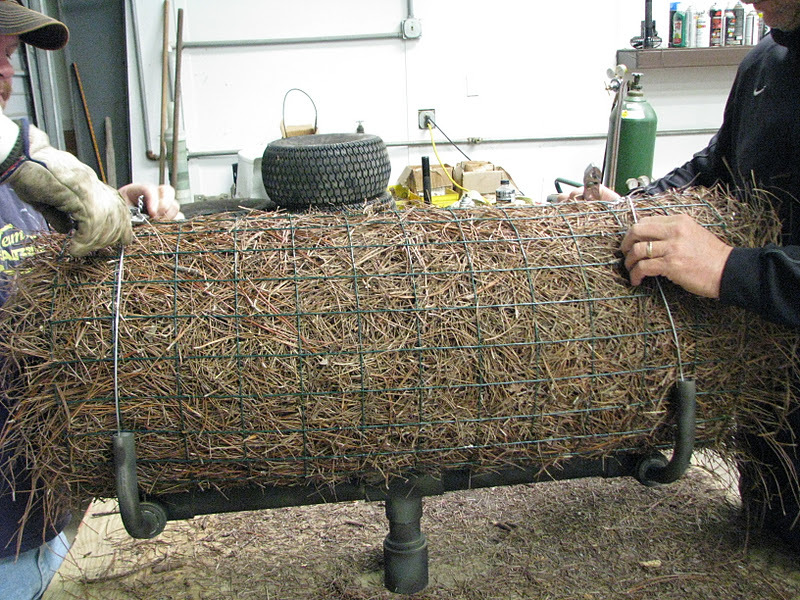 The nesting cradles are made to hold the 36" long nest tubes. A section of 2" PVC is used to connect the cradle to the post which will be driven into the ground. 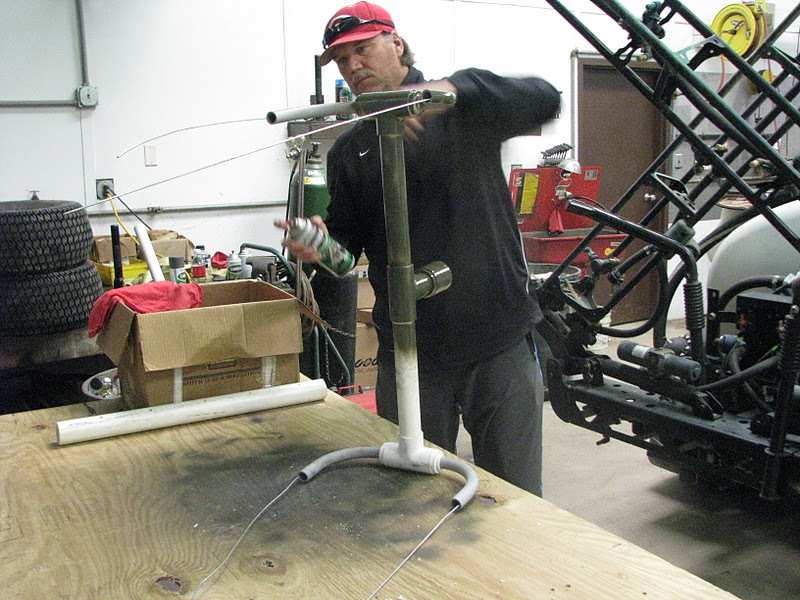 We used a 1.25" tee in the middle of the cradle with two sections of pipe extending each direction to reach 36". 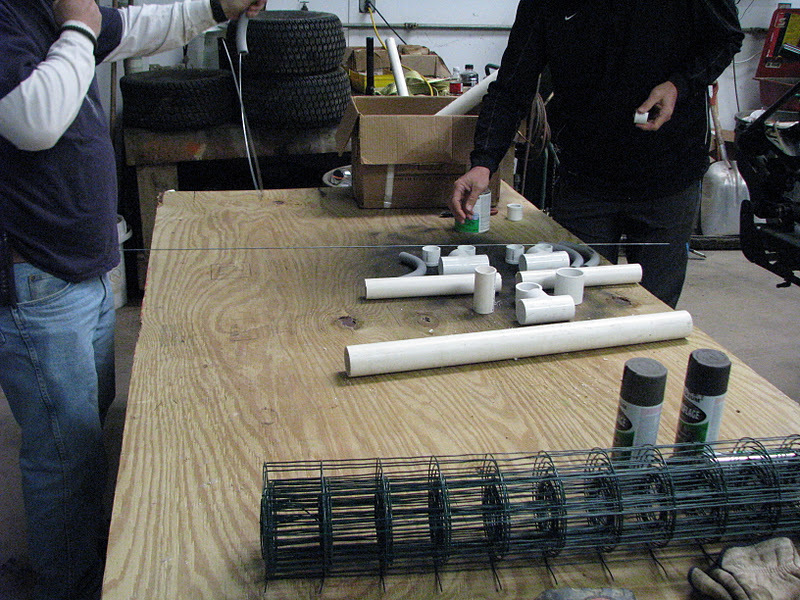 On each end another tee was used to which we reduced each end to accept a 3/4" electrical conduit 90 degree fitting. This is the final product of the nesting cradle. After a few trials Mitch and Bill determined that it is best to run the wire which will be used to secure the nesting tube to the cradle through the piping before you glue them all together. Once the nesting cradle was completed they used four different colors of paint to camouflage the piping. 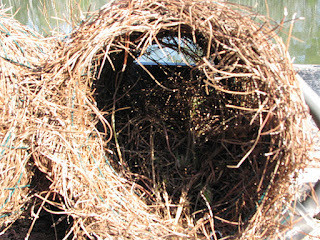 Built, camouflaged and completed nesting cradle and support tube. The structure of the tube is made up of a 7 foot long section of common 3 foot tall coated garden fencing with 2" x 3" spacing. The first three feet of the fencing is rolled into a tube and secured with hog rings or wire ties. 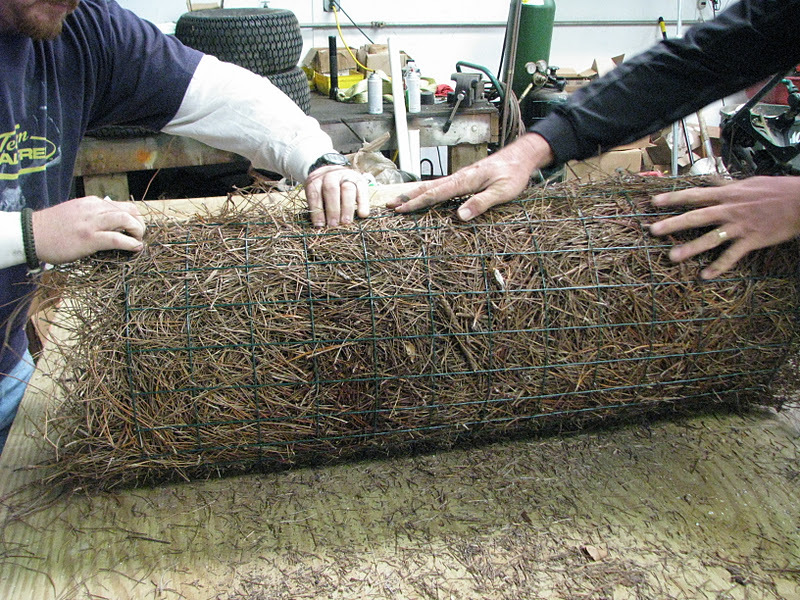 Once the center tube is secured the remaining 4 feet of wire fencing is covered with a 2-3" layer of material. We used pine straw but you could use flax straw or a common straw to your area but it is discouraged to use hay as it degrades rapidly and will not serve well over the long haul. 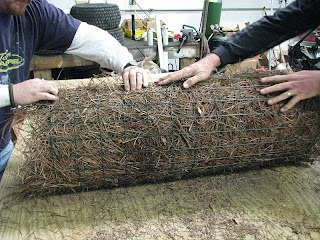 After the layer of pine straw was spread out over the remaining wire fencing, the previously constructed tube was rolled up over the pine straw. 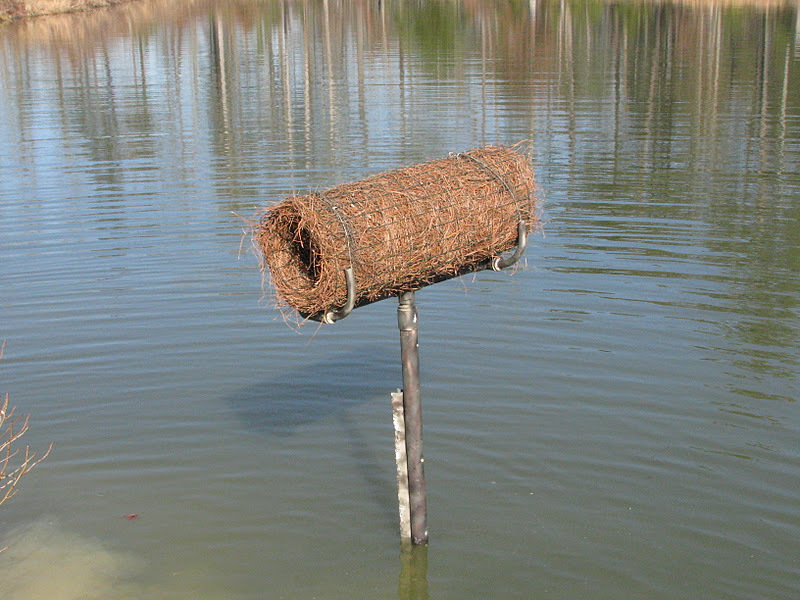 This creates a cylinder of pine straw which is small enough for the mallard duck to get into but not for larger predatory birds to reach and harm them. The end of the wire fencing was attached with hog rings and the nesting tube itself was complete. 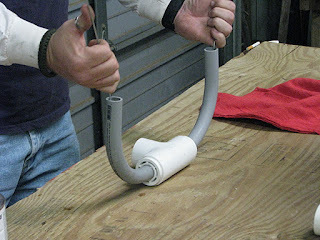 The nesting tube was placed in its nesting tube cradle and the two were secured together with the wire bands that were run through the pipe in the beginning. Ready for installation. The first part of the installation process was to drive the steel posts into the ground. 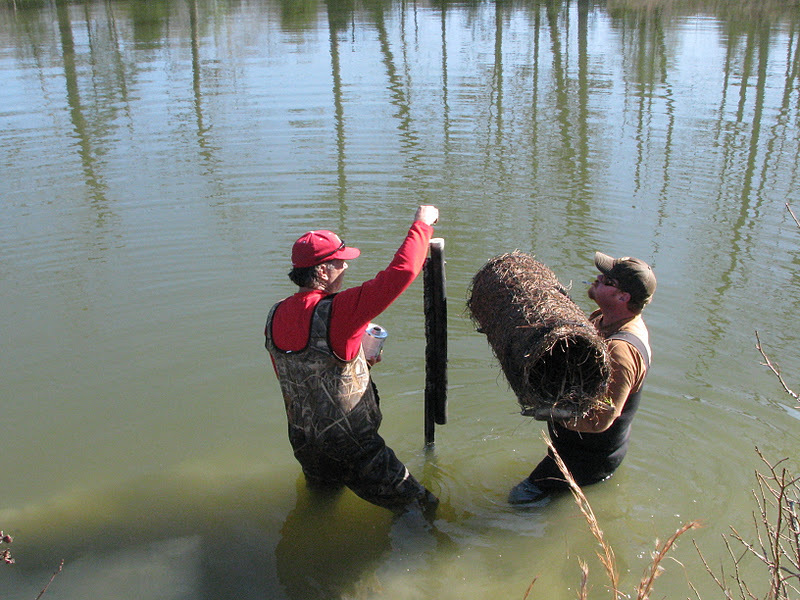 The nesting tubes need to be about 5 yards out from the bank and needs to be at least 3 feet from the water surface. We were able to acquire some 8 foot "U" Channel road signs from Don at the State Park. 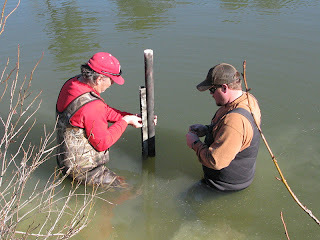 Bill and Mitch then used a post driver to set the posts in the lake bed. 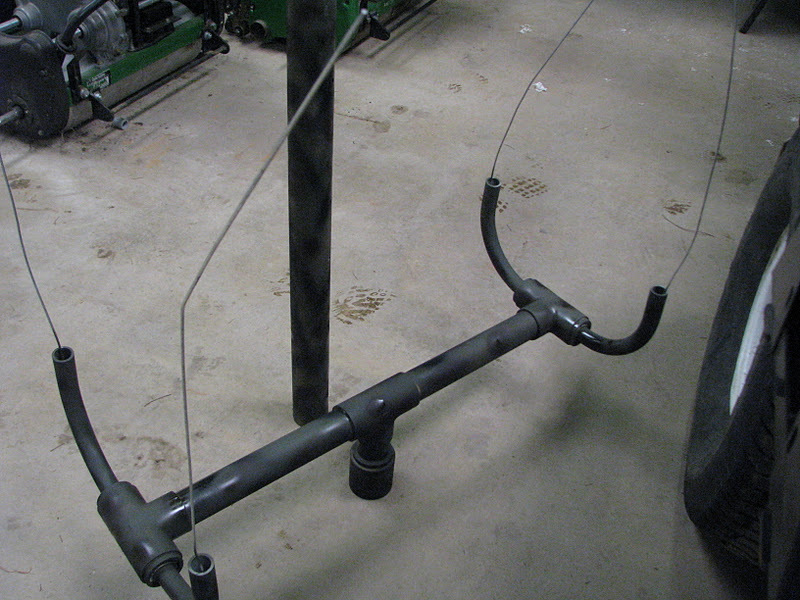 The 2" support tube is attached to the post with bolts so that it will be easy to remove and perform maintenance on. Prior to being installed on the posts the nesting tubes are filled about 2/3 of the way full with a combination of flax straw and broom sedge harvested from the surrounding area. 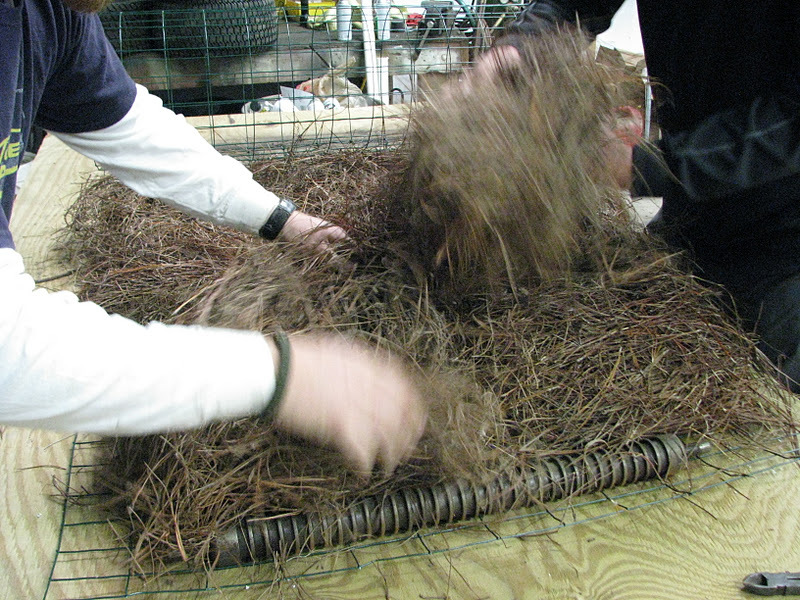 This will serve as the bedding for the nesting tube to keep the eggs safe and warm. 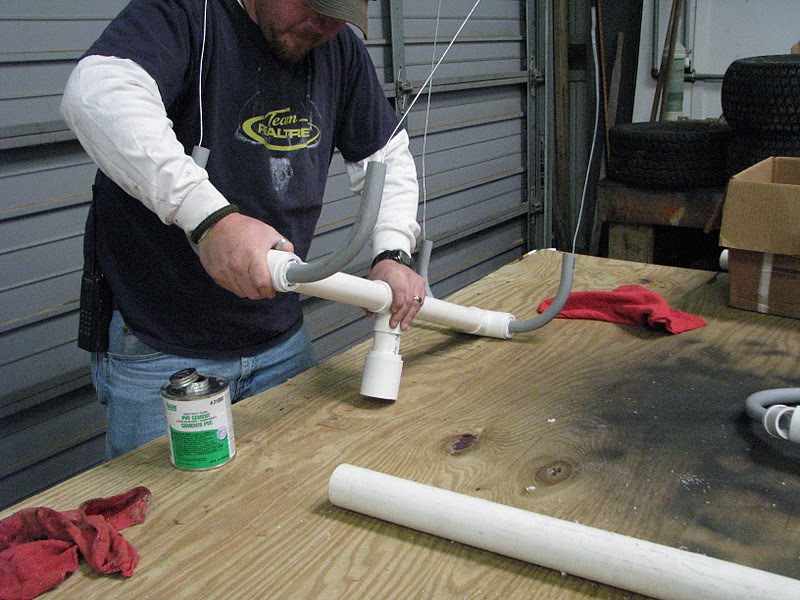 Once ready the tubes are brought out to the post and glued in place. Finished product ready for some homeowners. The project is really easy, we made and installed all the nesting tubes in two days. 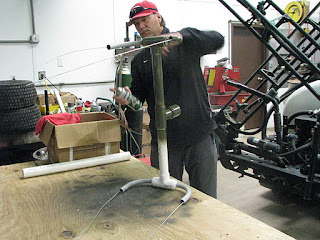 The materials cost us about $35.00 per nesting tube and will be a great addition to our conservation program. Bill has ordered some hatchlings which we will raise at the maintenance building for a few weeks and then introduce to the pond. These ducks should return to this "home" pond to raise their young. 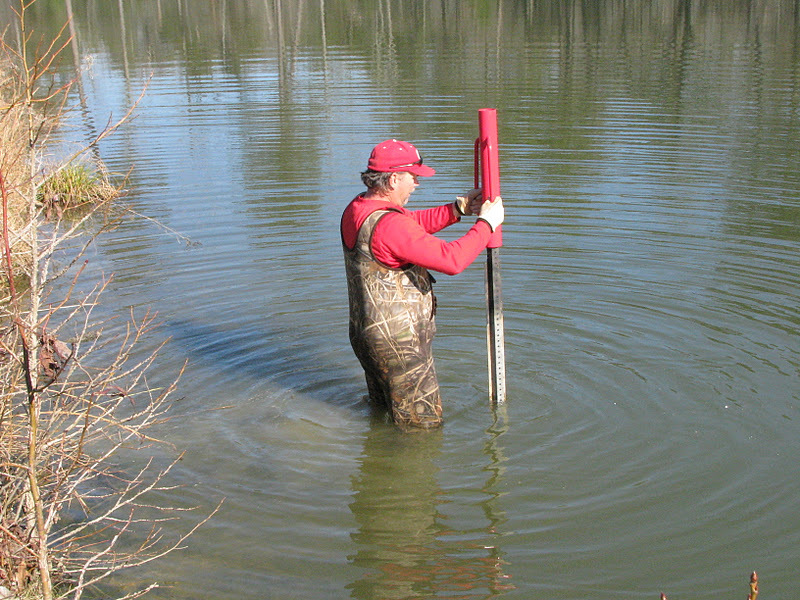 This is a very simple project to do and complete and will provide suitable, safe housing for waterfowl. Anyone who wishes to get more information about this project or has any questions about it please let us know. We will have follow up posts on this project as we go forward. Great job Bill and Mitch!!! Great post Paul. I love the idea, If you don't mind I think I'll copy your project and do the same out here! Fantastic step by step instructions the photos are the best part!! I do have a question though can these nests be placed in the yard? I have a small koi pond that a pair of mallards vist every day in my front yard, but the water is in my back yard. Also is there anything that will help them see the nest and be attracted to it? Chuck, The tubes need to be near or over the water to give the young a safe and soft place to land when they leave the nest. We have not done anything special to attract the two nesting pairs which have discovered a couple of our nesting tubes already. My best guess is they will find them when you put them out. Thanks for viewing the blog. Thanks Paul I have built a goose nest in my back yard and it has been there for five years with tennants. The last northester took it out this past winter and I replaced it with a 55 gallon plastic barrel type. Thanks to people like you the plans were posted on the internet and my tennants are back. I could send you a photo if you would like. Do you generally write only for your blog or maybe for some other online resources? How far apart do these need to be when placed in the water? I have a 2.5 acre pond and am wondering how many I can put in one pond. Ms. Johnson, Our nesting tubes are about 50-75 yards apart. We have 7 installed on our irrigation lake which is about 3.5 acres in size. Thanks for the question and the comment. Hope this helps. Just wondering what time of year you put them out, and if you bring them in after the nesting season, or leave out all year? We leave the tubes out all year, do not bring them in. If you are in an area with a lot of snow or ice the tubes might deteriorate more rapid which might mean you will need to bring them in and do some maintenance. Thanks for your interest and best of luck. great job guys we are going to be following your plans starting in a couple weeks to put some of these up on our river property. Great. Send us some pictures if you don't mind. 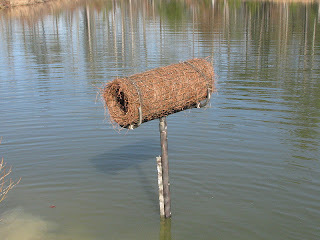 Also make sure you check out our follow up blog post http://bthbgcm.blogspot.com/2013/02/mallard-duck-nesting-tubes-revised.html if you haven't already. Few changes/improvements were made from the original in this post. Just wondering what the inside diameter of the wire is before you place the straw and hog tie the re-mander of the tube? Christine, you will end up with roughly a 12" inside diameter. Where can I buy and have installed on my pond near Hillsboro, Oregon? Dave, We do not sell these but they are easy to make. All the materials are available at your local hardware store. If you need any specific measurements that are not clear in the post please email me at paul.carter@tn.gov. Thanks. 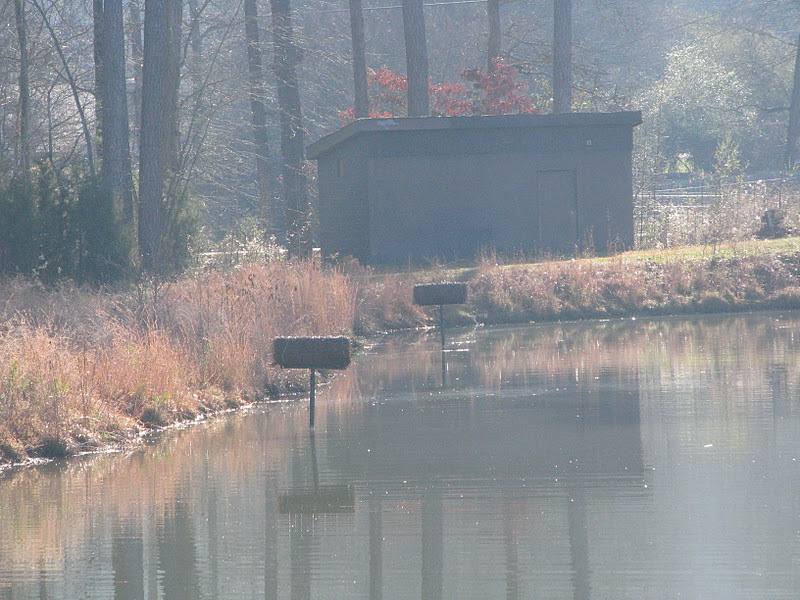 How about using a floating style nesting house/platform for these ducks. You can search for them and get lots of ideas. Depending on how much the water fluctuates it might work. Just as suggestion. Thanks for watching out for the wildlife. If you have a comment or question about The Bear Trace at Harrison Bay golf course maintenance operation contact me at paul.carter@tn.gov or at 1 (423) 344-6374.